I received a call from a client, and through a series of questions I discovered he was dry cleaning his suits every other week. You can’t help but brush against a dirty car sometimes. A suit may have lingering smells of coffee and food from the coffee shops and restaurants you’ve been in. It’s impossible to avoid sweating in a suit on hot days. Together, we determined that he was spending between $175 and $250 a month dry cleaning his suits! Here is the solution. It’s simple, quick, and painless. Not only will it save you money on dry cleaning, but it will also save the life and longevity of your suits. In my business, I wear suits every day. This is what I recommend for keeping your suits clean and pressed — without breaking the bank! However, if your garments are soiled with oil or grease from foods, or if you are caught outside on a hot day and you sweat profusely, that would certainly warrant the services of a professional dry cleaner. Ideally, this would be placed relatively close to your closet. 1. When you arrive home, turn on the steamer. Remove your suit. 2. Apply steam to the wrinkles in the break of the arms of your coat, as well as the coat front and back. 3. Apply steam to the wrinkles in the crotch and the back of your legs were the pant breaks behind the knee from sitting all day. 4. 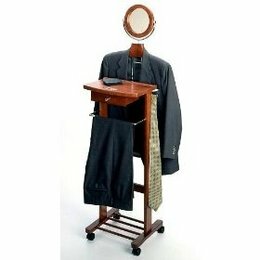 Lightly brush your suit coat and pants, and hang them on your valet to breathe and air out till the following morning. 5. When putting on a new suit the following morning, simply hang the suit from your valet (that you have steamed and allowed to air out overnight) on the hanger you just removed the new suit from, and let the rotation begin! This should be kept close to your suit valet. 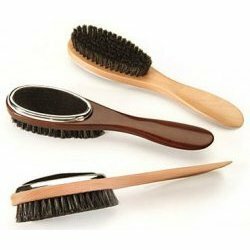 A good quality clothes brush can be used to remove light dirt and dust from the surface of your garments, as well as to remove lint or pet hair. IMPORTANT: When professional dry cleaning is required, make sure to dry clean both the coat and the pants together. This will maintain the continuity of the dye in the fabric of the garment. That way, your pants won’t fade to a color that no longer matches your suit coat!